Hello, baby it's cold outside, and we had a little snow. Looks pretty and I didn't have to go out today, so didn't mind it. We have been so snowless this winter that now it's like it's just an aggravation. Today's card is for the challenge at Penny Black and Friends Saturday Challenge, #188 the theme is LOVE AND KISSES. This beautiful stamp is a Slapstick from Penny Black and it is a Mo Manning image! 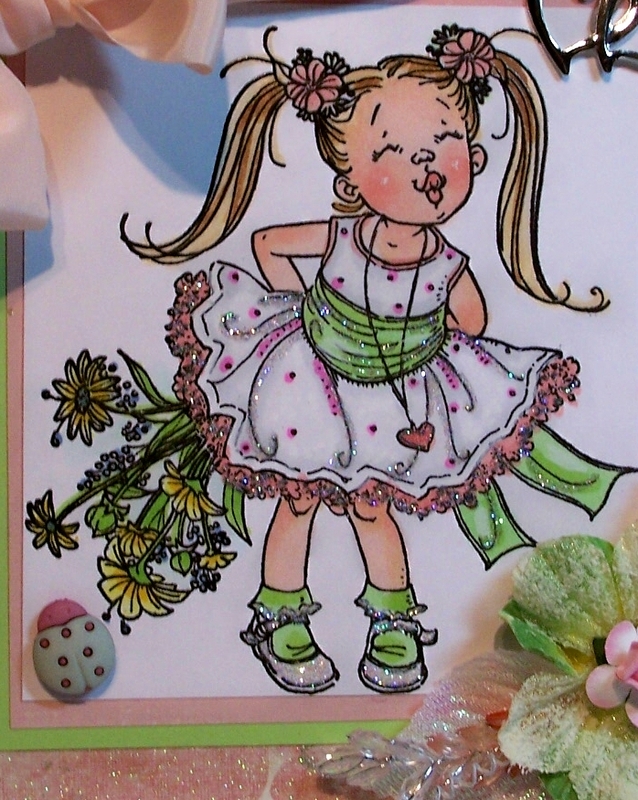 Oh the colouring in this is so fabulous, what a beautiful card Sue. You always continue to amaze! Aww sweet sweet card! Reminds me of some little girls I know! 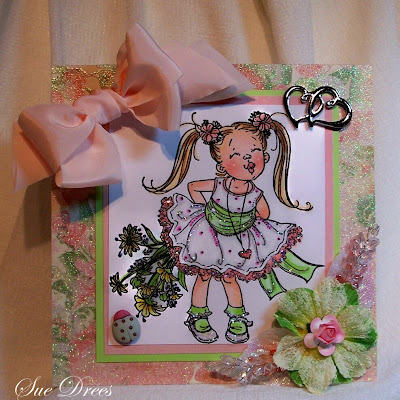 o what a gorgeous card sue, it looks fabulous. beautiful image and great colors you have used. Fantastic! I want that kiss....from YOU! Now THIS is a glittler queen! Sue, she is so darn cute and your embellishments are just right for this card. Coloring is fantastic and that ribbon is gorgeous. I LOVE coming here to your blog. You fabulous cards always make me smile. Our snow didn't happen, but it is bitterly cold out today, so in the craft room is where you'll find me. the background paper is beautiful for this card. Really cute and pretty! Love the sparkle! Oh this is gorgeous and so adorable.